I got an email recently from a woman who was struggling to make a big decision. She had been dating a guy for several months and he was ready to to take the next step of commitment with her. But she wasn’t sure. She felt torn, she said, and that made her a bit anxious. But she couldn’t put her finger on why she felt that way. Maybe you can relate to the position she was in—having a big, life-altering type decision to make, but not sure which way to go. The guy was great, she told me. Her friends loved him and he treated her well. On top of all of that, usually her mother didn’t like her boyfriends, but in this case she would make comments about how this was the “best guy she had ever dated” and how disappointed she would be if it didn’t work out. And so as her boyfriend waited for her to make up her mind and her friends doted over her with compliments about him and her mother made jokes like, “don’t screw this up!” she felt beside herself with anxiety. Am I supposed to feel like this? She wondered. Why “Finding Yourself” Matters So Much. You hear people talk about “finding yourself” all the time and yet most of us don’t really know what it means or why it matters. In fact, I think the term gets sort of watered down. We think of “finding yourself” as this cursory thing we do, on the side, if we have time, after we get the more important work of life done. We forget what an incredible danger it is to live life without knowing who you are. We forget there is very little progress we will be able to make in this life if we don’t have a firm grip on who we are and why we matter. The language psychologists use for a person who hasn’t “found themselves” is: lacking of a sense of self or a lack of personal identity and psychologists recognize that when a person lacks a sense of personal identity, their problems extend into every aspect of their life: relationships, career, even mental and emotional health. Not to mention, it can be really difficult to make a decision—even a small one. When we don’t know who we are, we end up spending more time wondering about what other people want from us than about what we want and need for ourselves. Which, of course, can be incredibly anxiety-producing. How can you possibly measure your success or progress or integrity in life if you’re measuring by other people’s standards? The measuring stick is constantly shifting, depending on your circumstances, your situation, your surroundings, or who is doing the asking. You feel pulled between your boss, your mom, your friends, your spouse, and maybe, just maybe, some very quiet, inner-voice. And at some point, you will let one or more of them down. You cannot possibly meet so many expectations. It’s exhausting. It’s awful. I’ve been there. And in many ways we are all there at some point in our lives—including the young woman who sent me that email—because finding yourself is not a one-time event. It’s a journey we’re on together (tweet that). Lack of Personal Identity and Depression. There is a psychologist and author named Albert Bandura who has done a considerable amount of research around something he calls self-efficacy, which could be translated: a strong sense of self. He makes a specific connection between a weak sense of personal significance and depression. I know depression is a complicated issue with lots of complicated answers. Not to mention, I have gone around and around with depression in my life. I’ve spent years on medication and in therapy and it hasn’t been until the past five or ten years that I’ve discovered some freedom from it. Just the thought depression is something that sort of haunts me to this day. But it hasn’t been until I’ve begun to develop a stronger sense of self that I’ve been able to find a bit of freedom from my depression. That is not a prescription, but it is a suggestion to consider that if depression is as much a part of your life as it has been of mine, it’s worth considering it might help to work on finding yourself. Bandura says, “A weak sense of personal-efficacy operates on the cognitive source of depression in several ways.” He lists three ways specifically, and since his prose gets a little thick from there, I figured I would translate them so they’re easier to understand. You can see his full text here. Third, it influences the story we tell ourselves about personal accomplishments and failures. Bandura’s research actually showed that people with a strong sense-efficacy felt slightly better about themselves socially and emotionally than their peers. The story they told themselves about their successes was, “that’s because I’m smart and capable,” and the story they told themselves about their failures was, “well… I couldn’t have been expected to do well because I didn’t get much sleep [or that person was distracting me… or whatever. ]” This isn’t to suggest we should have inflated egos (which can cause depressed states of their own) but rather that the story we tell ourselves about our successes and failures influences how we feel about ourselves. How do you process successes and failures as they happen to you? What does this tell you about how much control you have moving forward? What is the story you tell yourself about your personal accomplishments or failures? When it comes to finding yourself, depression and making big decisions, it shouldn’t surprise us that the mind and body are profoundly and miraculously connected. How Do I Know If I’ve Found Myself? A lack of a strong self often flares up during times of change or transition in our lives, since often times we mistake our sense of self for things like: the city we live in, the person we are married to, our job, career, money, family, status, etc. Our true self does not come from our outer-life. It comes from our inner-life. So when we move to a new place, leave a job, have a baby, see our grown kids leave the house, get married, or start in a new position, we often find ourselves thinking, “who am I?” This is normal and also an invitation into a deeper journey of finding yourself. Finding yourself is the process of discovering who you are and why you matter apart from outside achievements, relationships, and even in the face of great challenges or in life’s shifting environments. A person who is finding herself is learning to trust the the sound of her own voice, listen to her intuition, take action based on her convictions, face conflict and criticism with grace and power, and to visit that place of peace inside herself, despite what is happening around her. When you have a strong sense of self, you are able to adapt well to changes, to soothe yourself in times of sadness or discomfort, stay true to your convictions (even when there is outside pressure), avoid codependent or manipulative relationships, set boundaries with pushy people in your life, leave behind a constant need for approval, drop the guilt, receive criticism, act authentically, lead gracefully, and take responsibility for your life—no matter how it turns out. Yes, it is a huge task to “find ourselves” and one that is never fully finished. In fact, once we feel like we’ve “mastered it” life usually hands us more challenging and interesting situations to help us continue our path of growth. One hard truth about developing a strong sense of self is that so much of this important development takes place in childhood. If you have faced some kind of trauma in your childhood, or if your parents didn’t help you establish a strong sense of self—or if you came from a religious background where developing a strong sense of “self” was considered selfish—you might still have a lot of work to do when it comes to finding yourself. The good news is that it is never too late to begin your work. In fact, if you are feeling profoundly lost as you read this, you are in a beautiful place. Below I’m going to include a list of things that have been vital to my own journey of finding myself as I’ve been guided by great therapists, friends, advisors, mentors and my own intuition. Your journey will look different than mine, no doubt, but still, I hope this list helps. Know and own your story. Like anyone, there are parts of my story I haven’t wanted to own. Do you ever get that feeling when you think about how certain events have unfolded in your life? you think… truly. Honestly. Please God anything but this story. And yet, our stories are our stories. I am in process of writing my own brave new ending to my story. It is not easy. In fact, sometimes it feels downright awful. It means re-routing old beliefs, re-wiring brain patterns, letting go of ways of coping, learning to face the conflict and the joy and the pain of life unguarded, and it means I end up failing and losing my temper and crying in public more often than I would like to admit. I avoided seeing a therapist for years because I thought to myself, “oh, it’s not that bad. I’ve got this. Look at me. I have so many opportunities. I have a great family. What am I complaining about?” All the while, deep down I knew I needed some help to sift through the more complicated parts of my story. Do not try to walk this path alone. It’s too treacherous. If you aren’t comfortable finding a therapist, ask a few trusted friends or family members to walk with you. When you begin to re-write your story, parts of yourself you never knew existed (hint: less-than-pretty parts of yourself) will inevitably come up. When this happens, practice gratitude for the support around you and for the opportunity you have to heal and grow. Learn about yourself and how you are wired. I read all the time. I’m always trying to figure out more about myself, how I operate and why it matters. This has been a lifeline for me as I walk this journey of finding myself. Figuring out the driving motivations behind why you act the way you do not only helps you own your story, it also helps you interact and communicate in a positive way with others. Below, I am including a list of resources I have used that have really helped me to discover how I’m wired. This list is certainly not exhaustive but I hope it helps. We often “find ourselves” in the situations we most want to avoid. We find ourselves in unrest, conflict, discomfort, fear, illness, distress, loss, transition, change, disappointment, failure, even in bad relationships. So if we spend our lives trying to avoid these things, we may miss the very messages and lessons life has to offer us. These days I tell myself, over and over again, “everything that happens to me in life is an opportunity to learn” because I have learned the hard way—it is. What seems like the worst thing that could possibly happen to you might turn out to be the very best thing. Because sometime it takes losing ourselves to find ourselves. And when we resist these lessons, we resist the very beauty and joy life is trying to offer us. Think back for a moment to the young woman I mentioned in the beginning of this post who is trying to make a decision about whether she wants to marry her current boyfriend. Notice how much time she spent explaining what other people wanted from her, thought about her (and her boyfriend), or what they were expecting her to do. And trust me, I’ve been there. Here’s my advice for her: you already know your answer. It’s inside of you. That isn’t to say we don’t need the support and help of those around us. But it is to say we must be careful who we ask, because what we really need from those sources of support is not advice or direction. What we really need is someone to help us discover the answer we have always known all along. What we really need is to find ourselves. For additional reading, check out my list of recommended resources here. Excellent, very well stated and developed, thank you! I am grateful that you discussed the issue of the major misunderstanding by most people that “finding ourselves” is a one shot thing. I am convinced that at some level I will be “finding myself” right up to the millisecond before my death. However, that doesn’t mean I am a lost soul. It’s just that this is a lifelong journey and process. I was one person at 21 just before I married, another at 29 when I first became a father, another at 48 when the youngest headed off to college and we were empty nesters, etc, etc. The secondary and tertiary “me” was changing but the primary “me” changed much more slowly and profoundly. Keith—that is so true for all of us. Thanks for pointing that out. As long as we’re here on earth, we’re changing. Every new experience changes us, and we’re never finished with our work of “finding ourselves”. But those moments when we seem to reach a new understanding of ourselves sure is rewarding. I had so many thoughts running through my head as I read. First, “The Runaway Bride,” as Julia Roberts tries to figure herself out. Second, they think that some of depression is inflammation of the brain, I second their finding as I have reduced my body inflammation, I have a more positive outlook. As my son’s psoriasis flares (inflammation) so does his doom and gloom. Last and by far the hardest is when society says that introverts are bad and extroverts are good….that’s a tough thing to get over. Keep writing…you have amazing things to say! Thanks Ann! I hadn’t heard that depression and inflammation were connected, but it makes a ton of sense with my personal experience. I suffered from IBS issues for years (inflammation, Auto-immune, etc) and when my body was the most paralyzed, so was my spirit and mind. It’s amazing the connections between our mental, emotional and spiritual health with our physical health. Thanks for sharing that, and for reading. PS) Excited to hear about the healing you and your son are both experiencing—physically and emotionally! Bethany, that’s so great to hear. The insights you shared in your post are really insightful. Marriage has this special way of bringing all kinds of things to the surface for us, so we can deal with them. I hope my words are able to help you continue to find clarity and direction. Keep me posted on how things transpire for you. I’d love to hear what comes next! 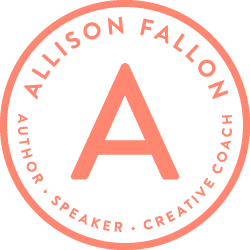 Allison your blog post was a beautiful response to an important question. I think the journey to self requires a certain softness and self forgiveness. There are pieces of ourselves that are hard to accept… attitudes and behaviors we would rather not admit to, or wish would go away. However those things are part of our whole package and the journey to self acceptance, to loving yourself, to believing in yourself, to finding that inner voice that knows exactly what is right for you… requires an acceptance of it all…. the good and the bad and an understanding that to be human is to be fallible… and every moment is a chance to begin again. I love the thought of adding softness and self-forgiveness to this whole process. That has always been a difficult posture for me. But you are so right: there are difficult parts of ourselves to accept, and we need lots of grace to do it—to be at peace with our whole selves, exactly where we are, no matter what. Thank you for reading and sharing your thoughts. Appreciate you. I really enjoyed reading your article and I am always impressed about the fact that it is possible to feel connected to a person you don’t know personally. Sometimes in life you feel alone and lost with all of your thoughts and emotions. In those situations it is a gift to realize that there are other persons at the same time, dealing with the same thoughts and emotions just by reading an article, having a deep conversation and being brave enough to share what is really going on inside. Thanks for sharing those issues! It’s the only way to bring us all into the process of finding ourselves and dealing with the ups and downs in our lives. Greets from Germany and keep it up! Sonja—what an incredible compliment. Thank you so much for writing. I love what you said and it’s amazing to me that I feel connected to each of you who are reading, too. I think about you all as I write and I love reading comments and emails from you. I hope these words can be comforting for you in those times when you feel again like you’re alone. You aren’t! Thank you for being a part of this and for sharing your thoughts here. Appreciate you. Wonderful post and very timely for me in particular. I had a conversation with someone recently and her situation was that her boyfriend was hesitant to commit further in their relationship until he felt that he had experienced life. Reading your words made me think that perhaps it’s less about experiencing life and more about discovering his sense of self. So much wisdom in this piece. Thank you. You’re welcome Delilah! Thank you for reading. There is a lot of wisdom you share in this post, Allison. It is so well written and truly speaks to my heart. I am in my mid-40’s and feel like “I still haven’t found what I’m looking for,” (Thank you, U2) Though I am happily married with two healthy, happy children, I have poured my life into them. All too soon, I will be in my own company again, so before I embark on that transition to an empty nest, I choose to be proactive and really know myself and be known. I have avoided this for so long, pushing past hurts deep down and staying busy to keep them covered. As a result, I’ve cycled through depression, anxiety and addiction. I am slowly sifting through the past, owning it, embracing it, letting go and moving forward. Kristin—thank so much for being vulnerable here. As this new season approaches, I know you’ll find the courage to keep digging deeper and discovering new layers of yourself. It will be scary at times, but ultimately a gift. Can’t wait to see what unfolds for you! Thank you for writing this! Over the last month or so I have felt so lost and kept thinking “how do I find myself?” The timing of this post was prefect and has been healing to read and contemplate these things in my own life. Once I am caught in this cycle it is so hard to break free. I think your advice has given me a boost to break the cycle and start a new one of discovering me, the real me. Kara—I’m so glad! Thank you so much for reading and for sharing here. Even though this post is months old, am glad i have read it NOW! Like you mentioned in one of those thoughtful quotes you shared with us recently, time is on my side! This post is so timely for me and very eye/heart-opening. I lost my dad in 2010 and it is still difficult to own and accept that part of my story. As i was reading through the post, my heart understands more that i need to accept my whole story and write my own brave new ending! Thank you and please keep writing! About relationships, sometimes we focus on what the other person is doing, what he/she isn’t doing and we get consumed with all that. But thanks for pointing out that it actually begins with us; searching within and embracing our whole being. Sometimes we behave is certain ways and we never take the time to ask ourselves why, i am learning that healing starts by intentionally paying attention to the “why” beneath our choices. I agree with what you said about religion too; “if you came from a religious background where developing a strong sense of “self” was considered selfish”. This reminded me of, “Love your neighbor as yourself”. Clearly, we cant give what we do not have, therefore, self-love is not selfishness. Thanks for this lesson too. I truly appreciate your openness to share your personal stories too, they teach me about vulnerability which was a no-no for me until i decided to take the risk! I am determined to take on the journey of self-discovery and i know the reward is worth the fight! I am reading all your old posts and trying to apply them to my life. You have been through a lot it seems and so I am trying to let you help me be positive. I also struggled with infertility. So when I had my son and couldn’t have any more, I made myself happy with that. We both suffered from depression, and when he took his life at the age of 25, well, I just lost all hope for anything and everything. Since then I have lost his little dog, my younger brother, my younger sister in law and my husband lost his job. I do my best to stay positive, but it’s very hard. I am wondering if you would write a post about loss. Just a thought. Thank you for this blog. I am a self victim if I can put it like that. I was engaged and had three beautiful kids with the guy however he left me and married to someone else now. I have been struggling to accept that he left me for another woman. This happened in 2008 ,my son was 4months by that time. I am very happy today that I have come across this article. I am in a toxic relationship but it is very difficult to make a decision. Reading this was exactly what I needed!